Some of the most popular Chinese topics include: how changing social values impact foreign businesses, China's political climate, the government's reform agenda, and Chinese people's search for values and religion. European topics include the rise of Islamism, history, Germany after reunification, and the creation of the new Berlin. Discussion about Li Rui papers. Interview on Islam's troubles in China. Read the article here. Interview with the Hong Kong publication on Chinese politics, search for values. Read it (in Chinese) unpaywalled here. Outtakes of my March 8 interview with Sherry Lee. One small correction: I meant to say my stick-fighting was *not* good (because it isn't!). Read it in Chinese here. In-depth interview by Sherry Lee, editor of Taiwan's leading magazine of long-form journalism. Read it (in Chinese) here. One-hour roundtable discussion on the economic and demographic challenges facing China, Inc. Listen to the podcast or download the show here. The magazine discusses my Foreign Affairs piece (read it unpaywalled here) on how China is coopting some religions and persecuting others. "Beijing's crackdown on religion clouds the holiday season for the country's faithful." "Chinese Authorities Raid Two Prominent Independent Churches." Read or listen to the piece here. An interview about journalism, working in China, cliches about China, my pet peeves about how foreigners write about China and.... Read the interview here. Talks in Bratislava and Kosice as part of their Pulitzer Prize winners' lecture series. Details here and registration here. Keynote speaker for a global commemoration on the anniversary of Nobel Peace Prize winner Liu Xiaobo's death, along with Herta Müller, Wolf Biermann, Liao Yiwu and Liu's recently released widow Liu Xia. Details, including Chinese, English and German versions of the talk, please click here. "Ethical Dilemmas: Rebuilding China's Moral Foundation," panel discussion with Rutgers University's Jiang Tao, moderated by Barbara Demick. "Gott und Glauben in Xi Jinpings China." neuen Werten im China der Gegenwart"
"Li Manshan: Portrait of a Folk Daoist"
Moderation of film screening by Stephen Jones. Details for both events here. "China's Search for Faith and Values"
12 noon to 2 pm. Details here. "The Return of Religion and China's Future"
Washington Marriott Wardman Park, Random House booth. Event report and pictures here. 5-6 pm "Media: Friend or Foe?" Details for all events here. hosting Zhang Lijia talk about her new novel, "Lotus." "The Battle for China's Soul"
East Asia Center, 5 pm. Discussion of faith, values and the Communist Party's once-every-five-year meeting. Discussion on "Souls of China," moderated by Andrew Nathan. Panel discussion with Elizabeth Economy, Andrew Nathan, and Yang Fenggang as part of CFR's Religion and Foreign Policy Workshop. Talk on China's religious revival. 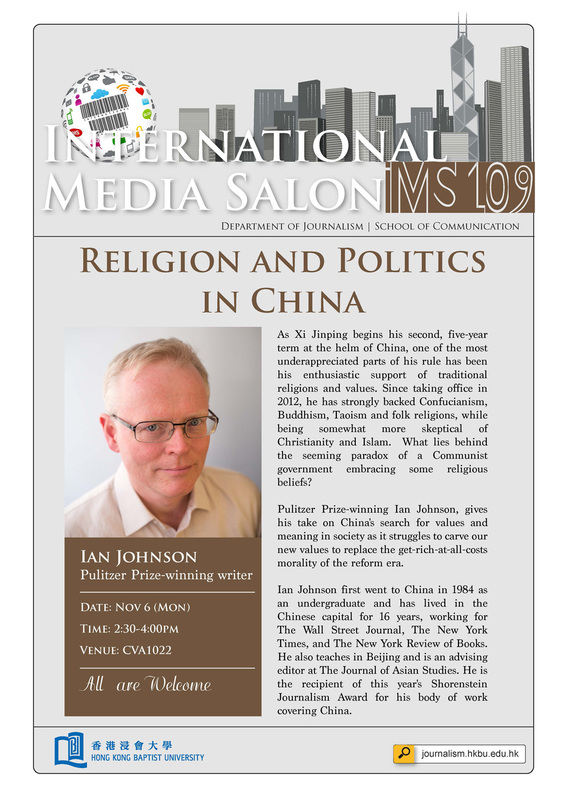 "The political uses of religion in China." Conversation with Jeffrey Wasserstrom of UC Irvine to talk about his new Penguin book: Eight Juxtapositions. "Ian Johnson on the Vatican and China:" 45-minute Q&A on the SupChina Sinica podcast about Catholicism in China, chances for a rapprochement between the two states, and recommended readings. Click here to listen and to read a description. "China's Religious Renaissance:" A 90-minute talk and discussion about China's religious revival, hosted by Kenneth Dean of the National University of Singapore and Francis Lim of Nanyang Technological University as the discussant. Some photos are online here. "How and Why Chinese Language Learning is Useful in Careers:" This obvious-sounding workshop (agenda here, including downloads of many of the papers) actually turned into a profound and lively discussion about how we engage with other cultures. I gave a talk--a "new manifesto" for foreign reporting that (I hope) will emphasize more language and culturally savvy reporters. The proceedings might be published in the coming year or two. "Non-fiction in China:" Part of a panel discussion with writers and academics about the future of long-form non-fiction in China. Click here for a link to an article in Chinese about some comments I made. "China's Religious Revival:" A talk at the East Asian Seminar on why religion is growing in China and the implications for society and politics. Details here. Talk to undergraduates from NYU and Universität Antwerpen on China's search for values. Talk to visiting students putting together a video project on religion on China, especially the Miaofengshan pilgrimage and Sydney Gamble's 1920s films. A talk in Hong Kong at the New York Review of Books' conference on "The Governance of China." "How to write about China:" Appearance on one of the most popular China podcasts, "Sinica," with regular hosts Kaiser Kuo, Jeremy Goldkorn, and David Moser. They interview me on a recent article I did in the New York Review of Books on journalism in China. "From Beijing to Berlin:" Public talk and discussion with Timothy Garton Ash on how 1989 played out in China and Europe, and its implications today. Radio discussion with Rebecca Nedostup of Brown University on China's religious boom, the country's spiritual vacuum, and the rise of indigenous religions, as well as Christianity. Listen to the show or go to the show's website. Appearance on Tom Ashbrook's On Point, with University of Chicago's Dali Yang and Duke's Kang Liu on why Xi Jinping has embraced a nationalist blogger. Talks in Chicago- and St. Louis-area high schools and at the U Chicago and U Missouri-St. Louis as part of the Pulitzer Center's public education program. No recordings available but links here, here, and here. NPR's "Fresh Air" a discussion on my first book, Wild Grass. It's one thing to write and talk about Chinese people's spiritual life in English; it's something else to address them directly in their own language. I'll be traveling to Taiwan this month to help launch the first Chinese-language edition of The Souls of China --see details below.